Being a teenager in Portland during the '90s meant that I was exposed to coffee shops at pretty young age. We had Starbucks everywhere, but several other local chains too, plus many, many independents. My favorite chain coffee-shop was Coffee People, an Oregon-based chain started by Jim and Patty Roberts. By the early '90s there were a lot of Coffee People locations, including two pretty close to my house in Beaverton--one of which was a drive-thru, not a common thing back then. My favorite store of their was the location on NW 23rd Avenue, a tree-lined walkable street lined with cafes and shops that I loved to visit, especially as a high-schooler. And my favorite treat to get at Coffee People was the Black Tiger milkshake. To this day, I don't understand why more coffee shops don't also offer milkshakes, since a coffee milkshake is an amazing thing. 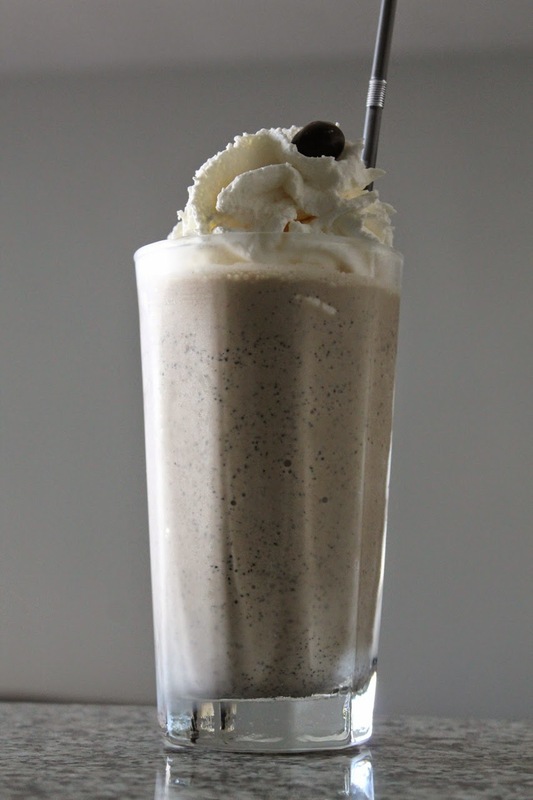 The shake was made with Coffee People's own Black Tiger ice cream, which I think you could also buy back then. It was unique for having coffee grounds mixed into the ice cream, giving it a grainy but not unwelcome texture. The drink was topped with whipped cream and a chocolate-covered espresso bean. As if this wasn't enough of a caffeine jolt, I believe you could get an extra shot of espresso added to it too. Coffee People went into decline in the late '90s. The original owners sold the business, which exchanged hands before disappearing almost completely (a lone kiosk at PDX airport became all the remained)--a pretty fast decline from its peak of 40 plus stores in its heyday, according to this Willamette Week article. The blog Caffeinated PDX has a great history of the company and interview with Jim Roberts. Lately, however, Coffee People is making a beautiful comeback. I spotted the Coffee People kiosk at the PDX airport last summer, and picked up some Black Tiger coffee (now made by Green Mountain Coffee). I hadn't noticed the kiosk for a few years. I thought it had closed, although perhaps it had just relocated to a part of the airport I never see. Regardless, it got me thinking about Coffee People and whether it could be making a comeback. Turns out it is...sort of. Almost 13 years ago, Jim & Patty opened their own independent coffee shop, Jim & Patty's, with a lot of the same marketing touches that made Coffee People special (including the iconic catchphrase: "great coffee. no backtalk"). In 2013, Jim & Patty's expanded to suburban Beaverton, and they recently opened a third location not far from where the Coffee People I frequented on 23rd Avenue was located. And, of course, The Black Tiger milkshake is on the menu. With the Black Tiger espresso beans I picked up in the airport last summer, I wanted to try a recreation of that classic '90s Portland treat. 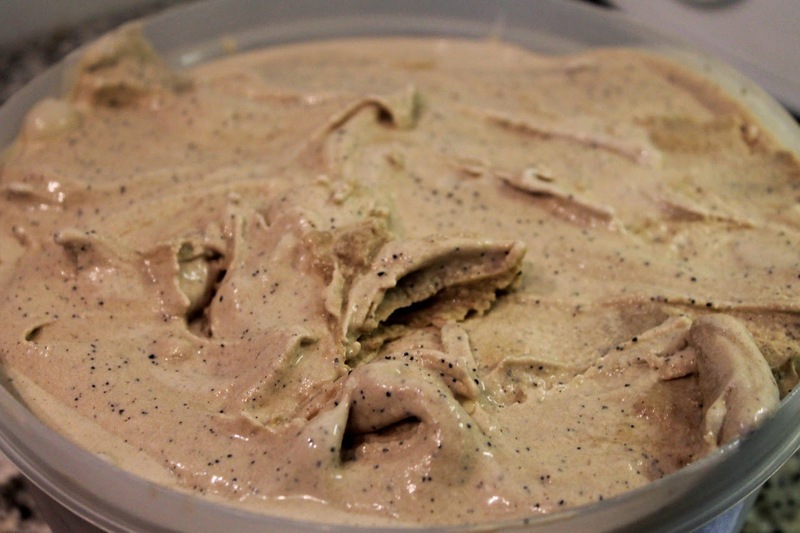 I made a basic espresso ice cream using the Black Tiger grounds--leaving the grounds in, of course. The ice cream is delicious on its own, but I knew I had to make it into a milkshake too. Just like it used to be served in Coffee People, I topped it with whipped cream and a chocolate-covered espresso bean, a garnish that was surprisingly hard to find in D.C. (Were they never popular in D.C.? They used to be quite common in Portland). With the weather finally starting to warm up, a good coffee shake is a great way to relax (with a bit of a jolt) on a warm day. 1. Combine ceram, milk, sugar, corn syrup and salt in a large (4 qt.) saucepan. Heat over medium-high heat until the mixture forms bubbles around the edges and makes a little steam (175 F on an instant-read thermometer). Remove from heat. 2. In a medium bowl, whisk the egg yolks together. With whisk in one hand, slowly pour about a cup of the warm cream mixture into the egg yolks, whisking the egg-cream mixture constantly as the cream is added. Add the egg-cream mixture back into the mixture in the saucepan, whisking to combine. Return to the saucepan to the stove over medium-low heat and cook, stirring constantly, until the mixture thickens and reaches 180 F on an instant-read thermometer (if the mixtures reaches this temperature before it thickens, remove the pan from the stove for a couple minutes, turn the heat down a bit, and then return it to the stove). The mixture should be thick enough to coat a spoon. 3. Remove the saucepan from the heat and stir in the espresso and vanilla. Allow it to cool a bit, then pour it through a fine-mesh sieve into a large (gallon-size) Ziplock bag. Seal the bag and place it in an ice water bath (this will cool it quickly if you want to churn it soon; if not, you can cool it in the refrigerator). Allow the mixture to chill. 4. When chilled, process the mixture in an ice cream maker until its texture resembles soft-serve ice cream. Transfer ice cream to a container and freeze until hard. Add ice cream and milk to a blender. Blend until smooth. Add additional milk if it's too thick. Poor into a chilled pint glass. Top with whipped cream and a chocolate-covered espresso bean.